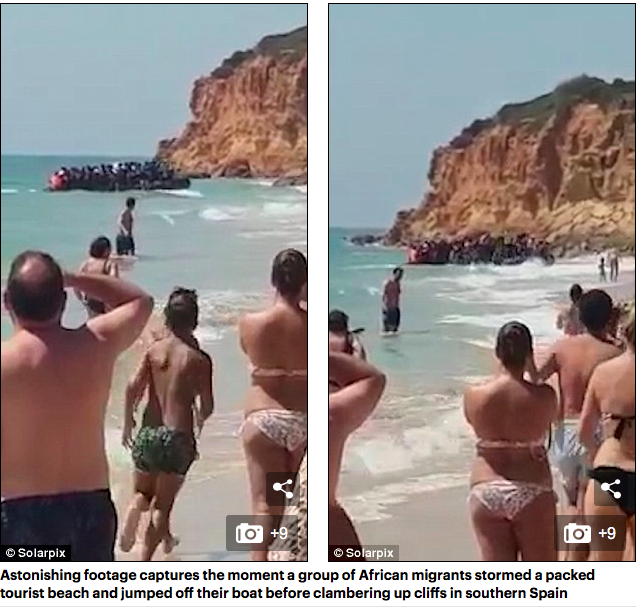 Last month around 50 migrants were filmed landing on a packed beach and sprinting up the sand at a beach in Zahora a half-hour drive away and close to the headland of Cape Trafalgar near where Horatio Nelson defeated Napoleon’s combined Spanish and French fleet. The men and women videoed jumping from the rickety wooden boat known as a patera in the July 28 arrival, were from sub-Saharan Africa. 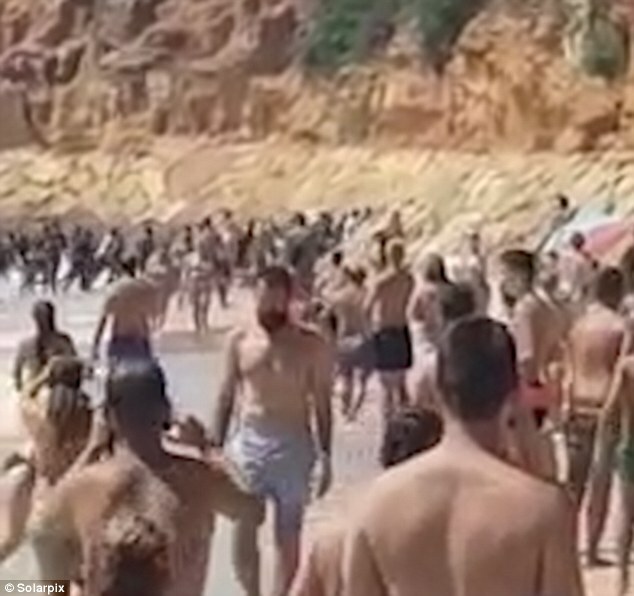 Days earlier, dozens of migrants were filmed storming another southern Spanish beach as confused sunbathing nudists watched on. 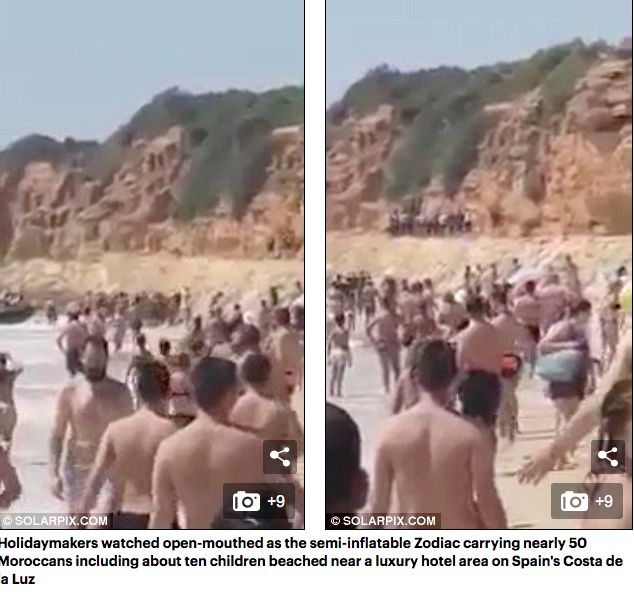 The dramatic clip, taken on the beach at Tarifa, showed a group of more than 30 migrants landing in a dinghy before sprinting off into woodland surrounding the beach to evade the pursuing Spanish border guards. The number of migrants and refugees using the western Mediterranean route to reach Spain stood at 20,992 between January 1 and July 25 according to the IOM, close to the 22,108 people who used it during the whole of last year. Coastguards rescued more than 60 migrants in the Gibraltar Straits yesterday – 28 less than on Saturday when 88 migrants were rescued. 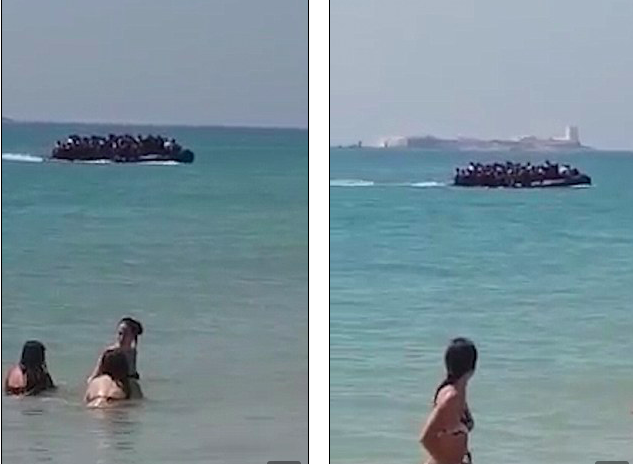 Meanwhile, Spain last week sent 116 migrants back to Morocco after they entered the country illegally. 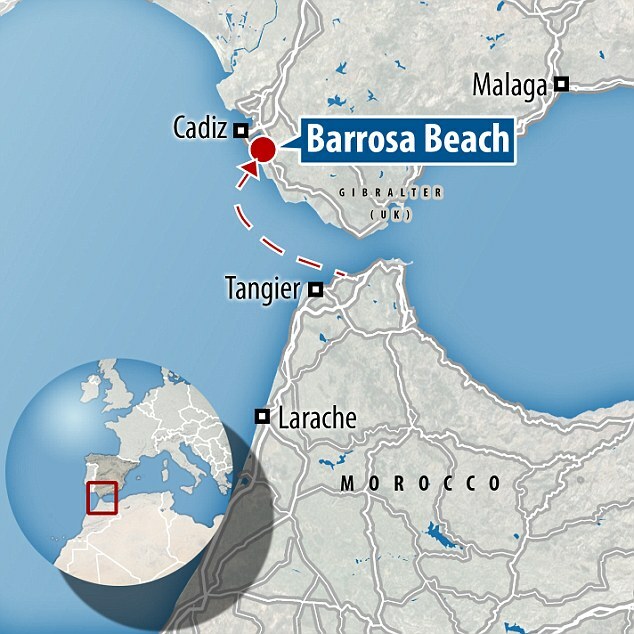 Deputy Prime Minister Carmen Calvo said a 1992 agreement with Rabat had been activated to expel the migrants. It came after the refugees used what she described as ‘unacceptable’ violence when storming fences separating Spain’s North African enclave of Ceuta from Morocco on Wednesday. Seven policemen were hurt in the incident. 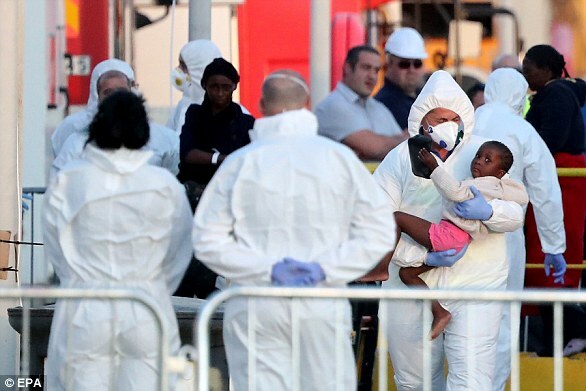 Calvo said Spain would keep receiving migrants rescued in the Mediterranean in a ‘safe and humanitarian’ manner. Sub-Saharan Africans living illegally in Morocco often try to enter Europe by scaling fences surrounding Ceuta and Melilla, Spain’s other North African enclave. Migrant arrivals in Spain have spiked in recent months, placing strain on public services and putting political pressure on the government. Most of the crossings last year were from Libya or Tunisia into Italy, known as the ‘Central Mediterranean’ route, says the EU’s Frontex border agency. Crossings have also dropped sharply from Turkey to Greece, the ‘Eastern Mediterranean’ route. After close to 900,000 migrants in 2015, Frontex recorded only 42,000 last year, essentially Afghans, Iraqis and Syrians. Nearly abandoned until 2000, this ‘Western Mediterranean’ route saw 23,000 crossings last year, mostly of Algerians, Ivorians and Moroccans. Since the start of 2018, 17,522 people have entered Europe via Spain, compared to 16,452 via Italy and 13,120 via Greece, the UNHCR says. The renewed popularity of the route is straining Spain’s law-enforcement response and its social safety networks. Around 12,000 people entered this way last year, most of them Afghans, Iraqis and Pakistanis – a sharp reduction from the 760,000 in 2015. But this path joins up with one used by migrants who have already passed through Turkey and Greece, meaning the actual numbers of new arrivals don’t always add up. An ‘Arctic route’ was briefly in operation 2015 when about 100 migrants crossed a day from Russia into Norway on bicycle. An Ivorian leaving from Abidjan might pass via Ouagadougou, Niamey and Agadez – Niger’s renowned ‘gateway to the Sahara’ – to reach Libya. ‘Thousands of others have never been found,’ it says.